The Theta trigger for the CZ P10 is a flat faced trigger that reduces pre-travel take up by 4mm with respect to the factory trigger. 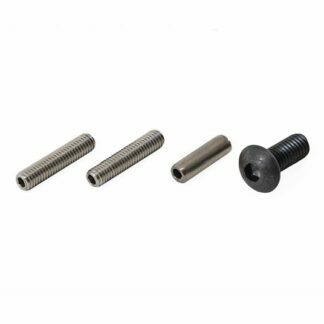 There are no adjustable screws or failure points, the pre-travel reduction is achieved through solid geometry that is machined into the body of the trigger. 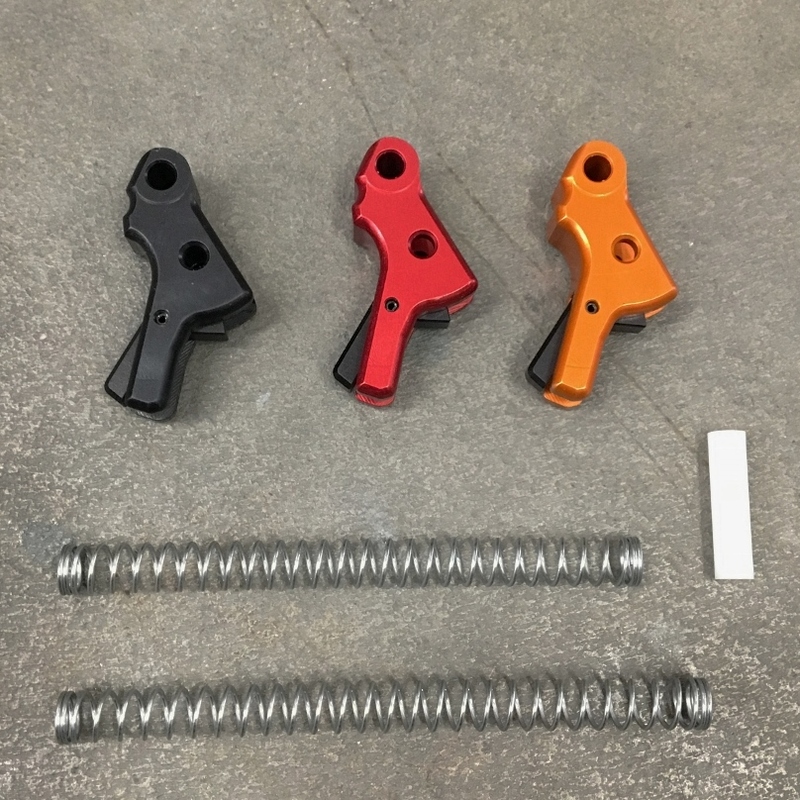 Our P10 Theta trigger kit also allows the user to tune the trigger pull weight by using the included 3.5lb striker spring or 3.0lb striker spring. When compared to other firearms in it’s class, the CZ P10 really does have a great trigger out of the box. It breaks clean with about 4.25-5.25lbs weight. However, if you are looking to remove the pre-travel take up, and/or drop the weight down to 3.5 or 3.0lbs, then our P10 Theta trigger kit is for you. Our triggers are precision machined from billet aluminum, available in several colors, and of course all components made in the USA. NOTE: HBI triggers manufactured in 2019+ fit ALL CZ-UB and CZ-USA models of P10 handguns. 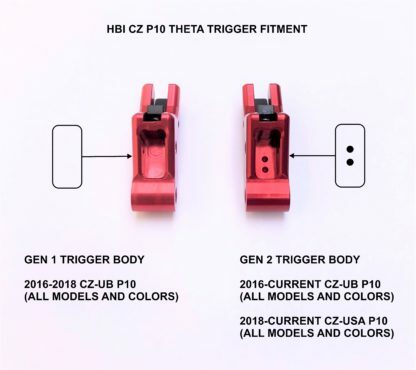 Triggers manufactured by HBI prior to 2019 fit only the CZ-UB models of P10C. Please see the last picture in the gallery above for visual identification of HBI P10 trigger types or email us sales@hbindustries.net if you need additional information. Congratulations! 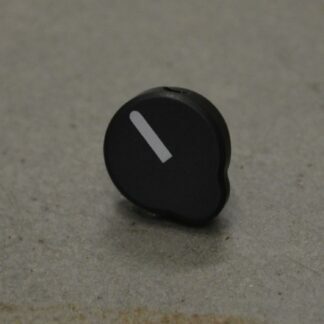 If you have made it this far into the description of our P10 triggers, you are really doing your research! 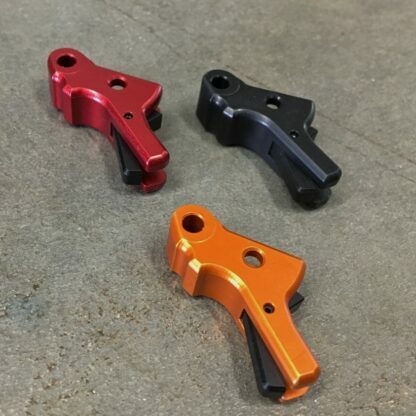 You deserve a special reward 🙂 In the link below you will find unbiased, unsolicited, data driven feedback on this trigger published by a customer that paid full retail price for the parts. One thing that you will not find are advertisements, or search engine ranking terms or tricks to help the author gain popularity. 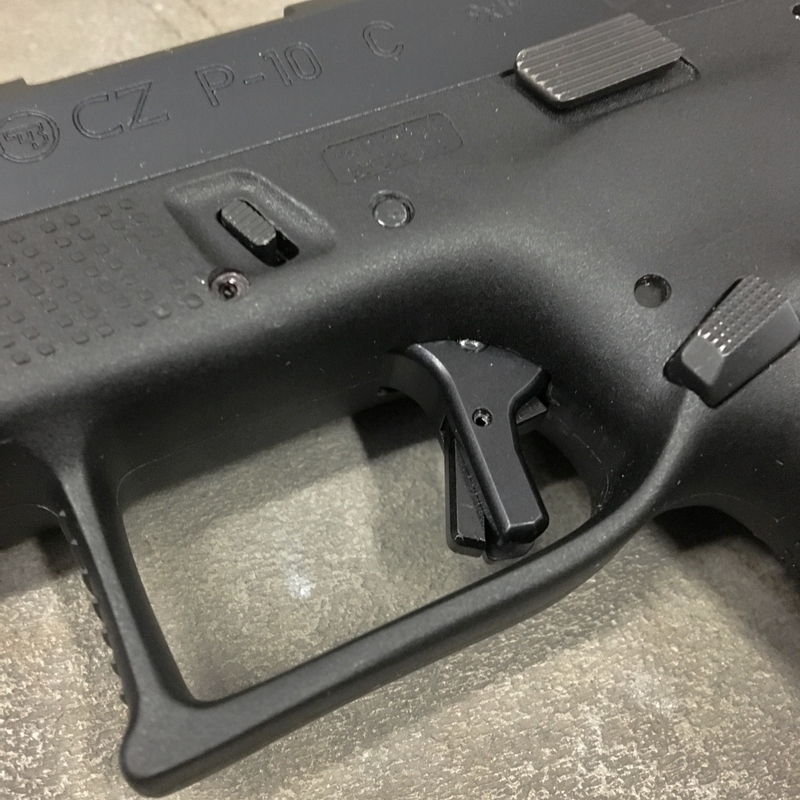 It is one customer’s honest feedback in its most simplest and elegant form: Minivan Doorgunner: CZ P-10C HBI Theta Flat Trigger . Special thank you to the author for taking the time and making this information available to everyone. How do you make the P10c even better? Look no further than this trigger. Great video to guide us with, as always. Keep up the great work……and taking my money, lol. The stock trigger is awesome and great right out of the box but the Theta trigger is other worldly. Best trigger on a striker fired pistol I have ever shot with (stock or aftermarket) its really down right amazing and I wouldn’t hesitate to buy one. Great Theta trigger for the cz p10c. Super smooth and sick reset. Would recommend it to all cz p10c owners. HB Industries keep up the good work. I was a fan of the stock P10c trigger out of the box and was not planning on replacing it until I saw the HB theta. Installation was simple and the on line video spot on. The new trigger completely changed the feel of P10 and eliminated a lot of the pre-travel. 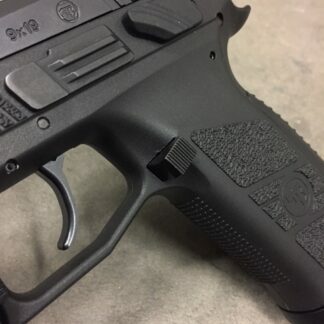 In short, you can’t go wrong with this trigger upgrade. I love the look of the trigger and the smoothness of the pull and reset. Only gave 4 stars because my finger keeps getting pinched. Nicely made trigger, with easy installation!!! The stock trig caused blisters when shooting a lot, but with the HB Industies trigger I’ve done over 500 at a time with no wear and tear to me or the gun! Using the lightest striker spring provided and lightly polishing the necessary points, after over 2000 rds, using my Lyman gage I’m still getting about 4 lbs as my average. For competition, I’d like to see about 2 lbs. Do you anticipate any competition trigger kits in the future? What a HUGE improvement! The stock trigger was giving me a blister after about 50 rounds and it’s much too nice a gun to put up with that. I bought the burnt orange and installed the 3 lb. spring and it feels great! A fantastic upgrade to a really nice pistol. Not being a “Gunsmith” I was hesitant to think I could do a trigger swap..watched the video install a couple times, and went with it.. once broke down I got out the dremel and hit quite a few areas and smoothed any and all metal to metal and metal to frame areas, the black finish is anything but smooth… Once done after thoroughly cleaning I reassembled and…OMFG!!! THE PISTOL IS TRANSFORMED!! The take up and over travel feel like they are GONE by comparison to factory, now the small stacking after you hit the wall before the break is all but gone! I can not say the trigger dqid that but it’s likely due to the polishing but I am SO happy with the pistols new trigger and polishing I can’t believe it’s the same gun.. It for mine is day and night..
Today was a first for me. I have never worked on one of my handguns myself but I did manage to install my Tungsten HBI’s trigger today. I watched the installation video a few times and actually played it while I was installing the trigger. Things could not have gone smoother. I used the 3.5 pound striker spring which resulted in a smooth, crisp trigger pull of 4.35 pounds with slightly reduced take-up, no over travel and a very short reset. I could not be happier with the results and would recommend the HBI CZ P-10 C Theta Kit to everyone. Best improvement for the P10c! The HBI trigger shoe is soooo much more comfortable to shoot! And you get 2 different striker springs so you can tune the trigger to your liking.The stock trigger was good but this made it amazing! Also the guys at HBI are also very responsive if you have any questions. Like others say the P10c has a great pull and reset, but this is much more comfortable! Very easy installation too! Installed the tungsten Theta trigger in my P10C suppressor ready model tonight. Very straight forward install if you watch the video a few times and have the proper tools. I must have gotten unlucky with the P10C I have. The stock trigger was breaking right at 6lbs. Decided to go with the 3lbs. 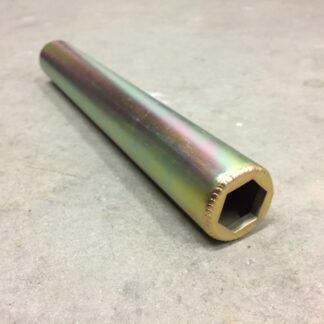 striker spring to lower the pull weight as much as possible. Did lower the pull weight, but I preferred the feel of the 3.5lbs. striker spring installed. Pull weight lowered approximately 1lbs. going from the stock to 3.5 striker spring. Reduced pre travel and a trigger shoe much more comfortable to the finger is worth every penny to me though. Maybe HB Industries or CZ will come out with a trigger return spring to help lower my pull weight in the future. Truthfully the trigger shoe alone is well worth the $65, highly recommended! Thank you, HBI! Great trigger. Great trigger nice upgrade to my p10c. Shipping was fast and installation a breeze with the great video. Install took 1/2 hour… not bad! The roll pins took a little more force to remove than I was expecting, nothing too bad though. The install went smooth and the trigger is great! I kept the factory spring and just replaced the trigger…. much improved! Takeup is much less and the grinding and grit I was getting from the stock setup is gone! Highly recommended! So, I’ve done this upgrade 4 times. …All in one night. (LOL) It was easy enough the first time, but once I put the pistol back together, the trigger didn’t work. 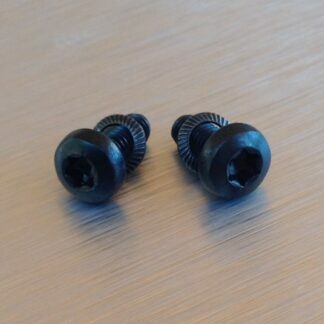 Long story short (which I already typed and deleted), the trigger bar disconnector and spring had flown out without me noticing, and there was a great gnashing of teeth and lots of wailing. Once I realized what was missing, the search was over pretty quickly. After getting everything back together for the final time, I have to say, it was worth every penny, and worth all the trouble I made for myself. (I can now do this trigger swap in about 3 1/2 minutes. ) I opted to install the 3 lb striker spring, and it feels SO nice. The flat trigger and flush safety make this the most satsfying aftermarket gun part purchase I’ve ever made. Fantastic trigger. The P10c is nearly perfection out of the box. With the Theta, it is pure perfection. This turns a very good trigger into an outstanding trigger. Every time I pull the trigger it feels like breaking the stem on a champagne glass. This installed without any fitment issues on my p10c with a 2018 serial number. 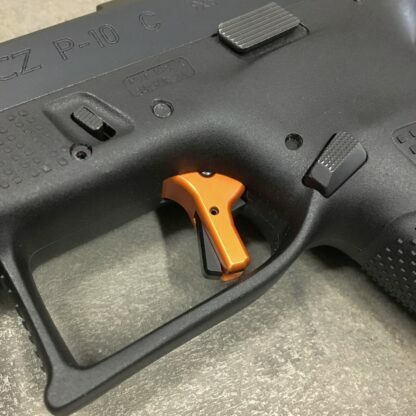 Your p10c is not complete without this trigger kit. 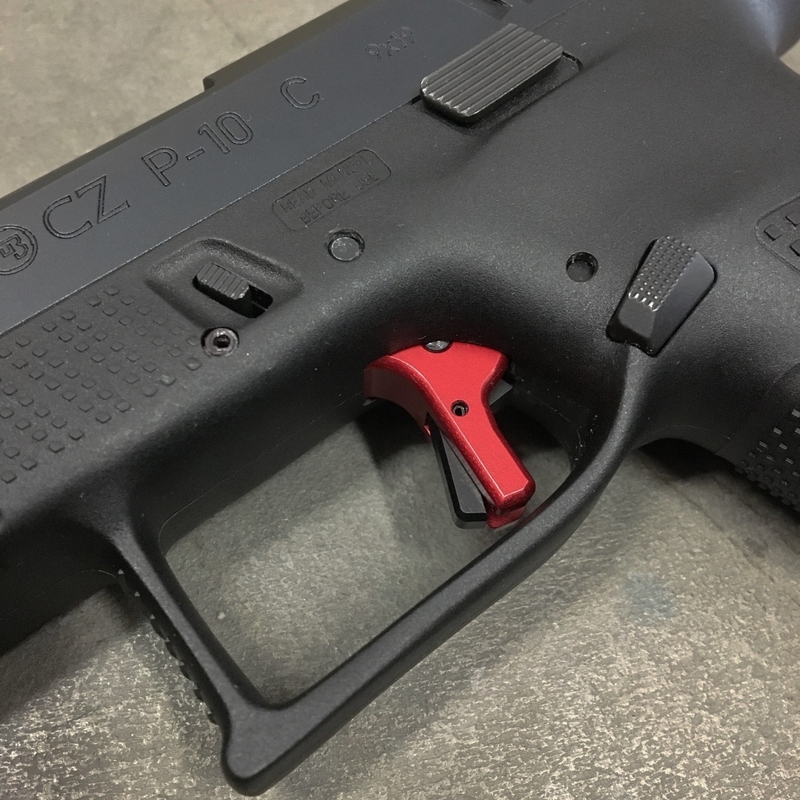 I just installed a red trigger kit in my P10c. I bought mine from CZ Custom since HB is out of stock but I wanted to leave a review here, since I believe it is a HB product. The kit is awesome. After learning how to disassemble and assemble the pistol, installing the kit was easy. The stock trigger would dig in to my trigger finger pad to where it was uncomfortable to shoot more than five rounds. Trigger pull was 4-5 lbs. With the Theta trigger is is a constant 4 lbs but feels lighter. Pre-travel feels shorter, great release and no overtravel. I did polish off the coating on the MIM part (sear maybe) and striker pin. Now to get the slide release to where I don’t need a 2 lb hammer to release it. Man, I was shooting good with the stock trigger but, I got the theta trigger installed and wow. It feels great, so smooth and definitely improved my groups. The theta trigger doesn’t hurt my finger. Thank you for such a great product. Great trigger!!! Roll pins were a b***h to get out but other than that everything was smooth. Reduced the uptake, short reset, and a nice clean break!! Well worth it. I hesitated for a long time, now I wish I would have gotten it sooner. Makes the already great trigger of the P-10c WAY better!!! The CZ P10c is my first handgun purchase. I have shotguns my whole life and I am an army veteran.I have a rifle and shotgun, but decided the way the world is getting kind of need to have the means to defend myself and my family and friends from danger oh, so I went with the p10c and I am glad I did, it is great it off thin box,but with this HBI trigger upgrade, that I have been looking at videos and doing a little research on I wanted to fill it before I ordered online oh, so I walked in my local gun shop where I bought my p10c and he happened to have one that I got to try first and within seconds of dry firing in the store,I told him I will purchase it.This was a world of difference,It took out over half of the already very little pre travel in the trigger play and my finger no longer gets pinched during a range session.This trigger upgrade is the best upgrade I have done, this is definitely the best with my night fision night sights a close second. Not only does it look good, it feels awesome. Love the install vids from HBI, just makes it easy and fun to do all these mods. First off, I love the Theta trigger. Take up was sinificantly reduced. I appreciate the engeineering behind the striker springs. I like that my trigger pull isn’t actually 3.5 lbs. HBI made the aftermarket springs around the original (an ~4.5 lb pull). My inital pull was around ~5.2. After installing the HBI striker sponging the pull dropped to around 4.2 lbs. the reduction in trigger pressure is relative, not absolute. Also, shoutout to Paul!!! He refunded me the First Responder Discount after I already paid for the product. Y’all didn’t have to do that, but I appreciate it a lot. I know a few guys with P10Cs, I’ll definitely be referring them.